This etching is one of ten made by the printmaker Louis Surugue after paintings by Jean-Antoine Watteau. Watteau painted a number of theatrical subjects and also used them as part of his larger compositions of gatherings called 'fêtes galantes'. The text below this etching focusses on the character Crispin's flirtation with the young lady and suggests that theatre, though comedy, often reflects life. Commedia dell'arte was an Italian form of improvised comedy, interspersed with musical and acrobatic routines, performed by troupes of travelling performers from the middle of the 16th century. It became popular throughout Europe and in royal courts, especially in France, and influenced other dramatic forms. Costumes of the commedia dell'arte characters would be instantly recognisable to viewers based on the social status suggested by the costume of the non-masked characters, such as the lovers (innamorati), around whom the stories often revolved, and the coloured leather masks, costume, props and gestures of the stock comic characters. The Harlequin, recognisable by his contrasting, two-colour costume and black mask, was one of the scheming servants (zanni). Pierrot is a variant of the melancholic character Pedrolino, who wore white and a whitened face. Scapino is a variant of the character Brighella. The painting after which this etching was made was owned by Sir Joshua Reynolds and is now in the Waddeson Collection. 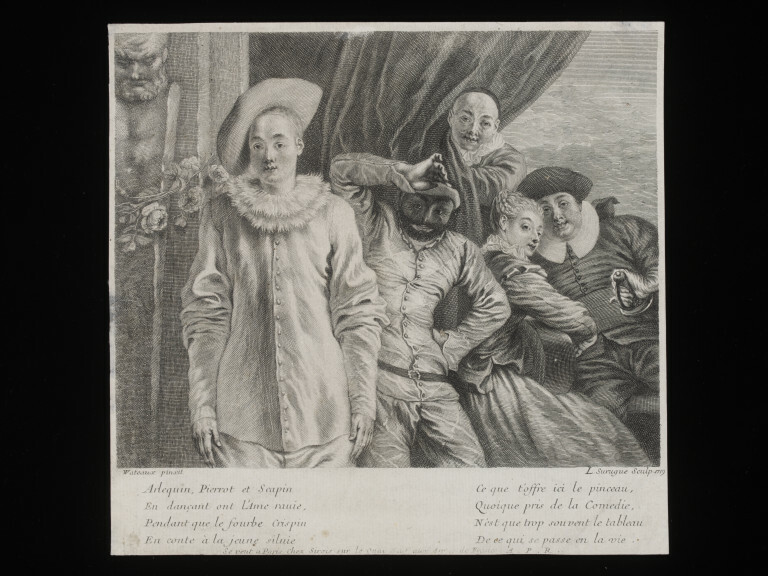 Image showing Pierrot, Harlequin and other commedia dell'arte characters standing in front of a stage curtain. Pierrot stands to the left next to a sculpture. To his right in front of the curtain, are, from left to right, Harlequin in an animated pose with hands on hip and cap, wearing a black mask; next, a young lady identified in the verse as Silvie playing the guitar and sitting in profile facing right, but looking over her right shoulder roughly at a point to the right of the viewer; sitting next to her Crispin, with his face leaning in towards hers, a portly figure wearing black buttoned coat with white collar and black rimmed hat. He has a sword. Behind the front four figures, visible between Harlequin and Silvie, another capped and masked character, Scapin, looks out over them from behind the curtain. Below the image are eight lines of French verse in two columns. Arlequin, Pierrot et Scapin / En dançant ont L'Ame rauie, / Pendant que le fourbe Crispin / En conte á la jeune siluie / Ce que t'offre ici le pinceau, / Quoique pris de la Comedie, / N'est que trop souvent le tableau / De ce qui se passe en la vie. Purchase from R. Jackson 1889. This one of the ten engravings after paintings by Watteau that were published by Sirois between 1717-26. The plates were bought afte his death by François Chéreau in about 1726-1728, who substituted the address below the print for his own (see refs, Glorieux). 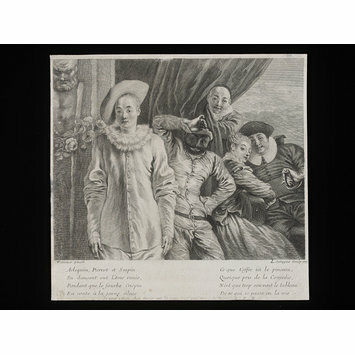 Etching, Harlequin, Pierrot et Scapin, etched by Surugue after a painting by Watteau; French, 1719. Glorieux, Guillaume. À l'enseigne de Gersaint. Edme-François Gersaint, marchand d'art sur le pont Notre-Dame (1694-1750). Seyssel, Champ Vallon, 2002, p. 183.